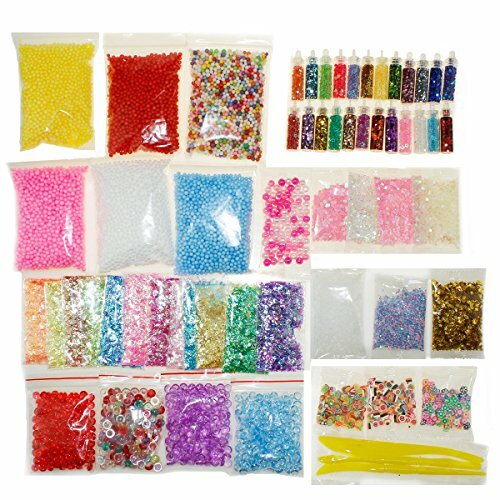 There are 24 glitter tablets bottles, 12 color sugar paper, 6 color slime foam ball, 6 pieces of colorful sequins, 4 color fish tank beads, 3 bags of fruit/flower/cake slice, 3 slime tools, 1 pack rainbow pearl, 1 bag of rice beads. Add variety glitter in your slime to make it different and unique. Mix it, mold it, and squish it. Add texture to your homemade slime with this slime kit. Create your own slime creation. Perfect gift or present for children to develop their imagination and creation. Used as weddings, birthdays, baby showers and celebration decorations for making mucus, vase filling, gift box, flower arrangement, DIY craft, family wedding decoration, etc. 60 Pack Slime Supplies Kits: One package including 60 pieces, that is 12 colors sugar paper, 6 colors slime foam balls, 24 glitter sheet jars, 4 colors fishbowl beads, more colorful sequins and fruit slice. Various items to meet different demands. Making Your Own Slime: Variety of glitters making your slime different and unique, beautiful slices with lovely shapes such as fruits and cakes, and other colorful foam beads, fishbowl beads, mylar flake allowing you to make slime in your own style. DIY Slime Decoration: Slime supplies kit applied as birthday, wedding, baby shower and party decorations. Various colorful sequins and glitter, DIY slime accessories, making party theme special and charming, and absolutely lighting up your children slime party. Wide Applications: Perfect for making slime, vase filling, gift box filling, flower arrangements, DIY craft, home party wedding decoration and so on. Warm Tips: Not suitable for the children under 3,only for playing, not edible. If you have any questions about this product by Aneforall, contact us by completing and submitting the form below. If you are looking for a specif part number, please include it with your message.